Kojo Senoo/Pipe Dream Photographer New York Public Interest Research Group (NYPIRG) gathered signatures in support of the Green New Deal at Oak Fest, a student-organized backyard music festival featuring bands like PlayShoes (above). As Earth Day draws closer, many students will celebrate the environment in various ways. 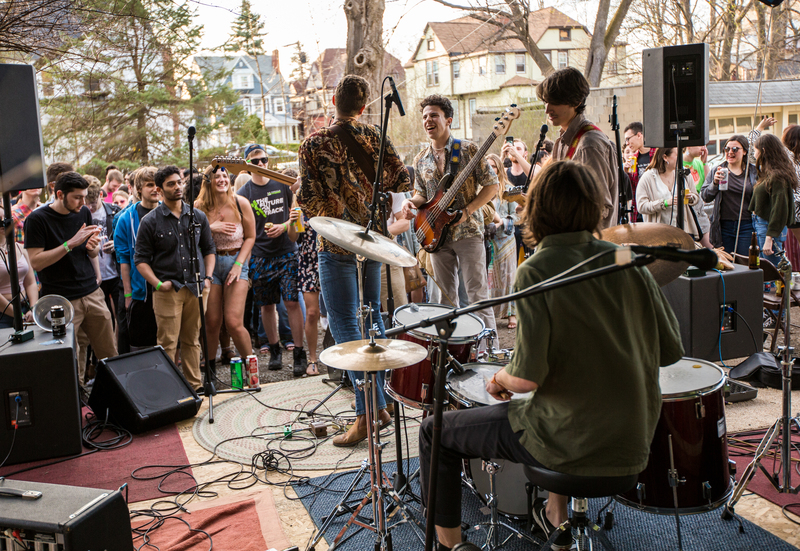 This past Saturday, April 13, the students of 101 Oak St. fused entertainment, art and activism in their third annual Earth Day event, this year rebranded from Earth Dage to Oak Fest, a student-run music festival honoring the earth. Starting at 3 p.m. and running past midnight, the event took place in the backyard of 101 Oak St., a residential house on the West Side in Downtown Binghamton. People gathered around a platform that served as the stage to listen, sing and dance along with student bands like Ben Franklin and The Electric Keys, The Landshark Committee, Natural Action Committee and natural born kissers performing. Several bands from out of town were invited to perform as well, including headliners Stuyedeyed, an indie-rock band from the Bedford-Stuyvesant neighborhood in Brooklyn. 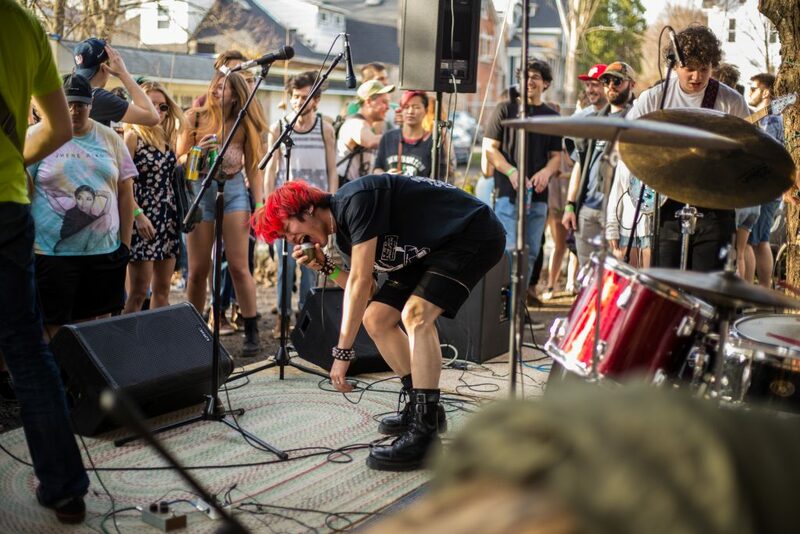 Other out of town bands and artists included Starbat!, Playshoes and rap duo Your Mystery Guest, who opened for Yaeji at last spring’s Binghamton Underground Music Presents (BUMP) show. Later in the evening, attendees headed inside for indoor DJ sets by Buzi, Taegyu and VONABROOK. Lizzy Price, a sophomore majoring in environmental studies, said she liked the music and the environment was friendly. The festival was sponsored by Binghamton University’s branch of New York Public Interest Research Group (NYPIRG). The student group collected signatures in support of the Green New Deal, a policy proposal to help push the United States toward a more sustainable future. Along the periphery of the backyard, student organizations such as the Food Co-op, Decol A, Ideas Club and the Service for Health, Inequality reduction, Natural disaster relief and Education (S.H.I.N.E.) set up tables to promote various environmental causes. Students alongside NYPIRG sold cookies, chili, cornbread, drinks and numerous other snacks. Proceeds from $5 tickets also allowed for $1,000 to be donated to environmental activism organizations. Dheiva Moorthy, a freshman double-majoring in environmental studies and sociology, tabled with DIVEST BING at Oak Fest. She emphasized that activism was central to the concert. Natalia Romanzo, a senior majoring in environmental studies and NYPIRG e-board member, stated that sending student signatures to Anthony Brindisi, 22nd congressional district representative, sends out an important message to our leaders. The Landshark Committee (above) was among the bands who performed at Oak Fest, a student-organized backyard music festival. LeeAnn Epstein, festival manager and a sophomore majoring in theatre, expressed the dedication and hard work the event staff put into organizing Oak Fest. Festival manager and producer Jeff Bagg, ‘18, added that Oak Fest was an entirely student and volunteer-based event. Bagg said that the student hosts had a background in playing their own music and supporting other student bands, and Oak Fest was an especially rewarding way to continue this tradition.